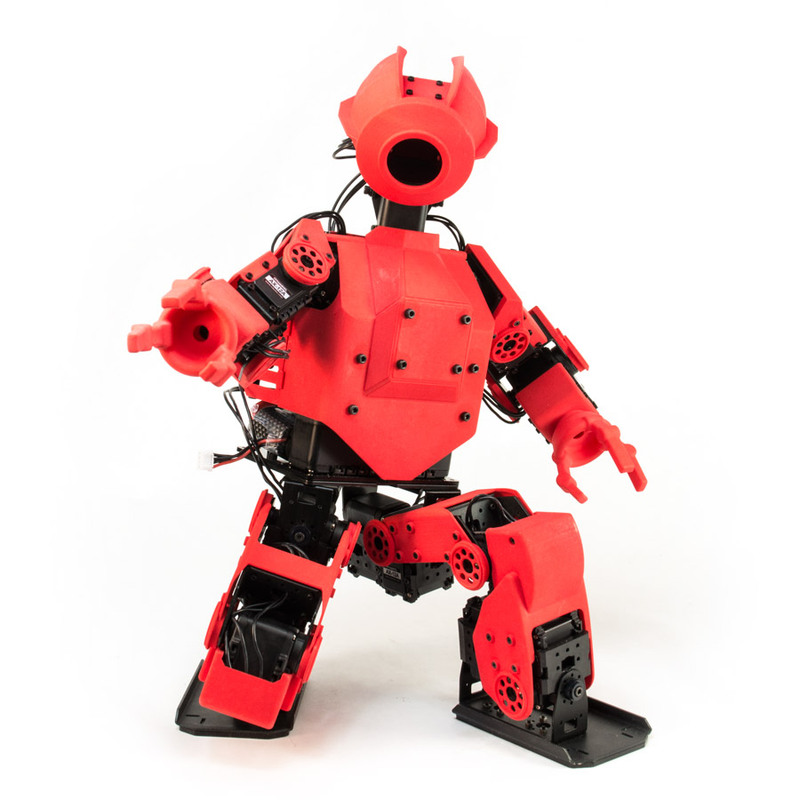 The HR-OS1 is an open source humanoid platform that you build yourself, is powered by an on board Linux computer and can be customized with 3D printed shells and components to change its form and function. Hackable and modular, this humanoid robot development platform designed from the ground up with customization and modification in mind. A node.js interface and API have been created to enable apps and other computers on the network to interface with the robot via wifi. We also offer full support of the Playstation DS3 Sixaxis Bluetooth Gamepad for remote control demos. The HR-OS1 was designed for flexibility and comes with multiple options for an onboard Linux computer. The kit is currently being shipped with and is compatible with the Intel Edison and Raspberry Pi 2. ODROID and Minnowboard Max support are currently being tested. The Intel® Edison is a brand new system-on-a-chip (SoC) packing an Intel Atom dual-core CPU on a chip the size of an SD card. The Edison has integrated Wi-Fi, Bluetooth LE, memory, and storage allowing for high level development and connectivity on small mobile robot platforms. The Edison operating system is OpenEmbedded Linux created using Yocto. The next-generation Raspberry Pi 2 features a Broadcom BCM2836 SoC, with a quad-core ARM Cortex-A7 CPU and a VideoCore IV dual-core GPU; 1 GB of RAM with remaining specifications being similar to those of the previous generation model B+. Our Raspberry Pi 2 kits ship with a pre-flashed SD card (flashed with a custom Raspbian Linux distribution) as well as wifi and bluetooth dongles. The HR-OS1 uses the Arbotix-Pro sub controller for DYNAMIXEL actuator communication and sensor input. This custom board from InterbotiX Labs boasts a 32-bit ARM Cortex-M3 72mhz CPU and is packed with features like sixteen 12-bit analog inputs/GPIO, ACC/Gyro 6-axis IMU, DYNAMIXEL power control with TTL and RS-485 communication options, Xbee/TTL/USB serial communication, battery voltage monitoring and speaker output. The HR-OS1-Framework, based on the open-source DARwin-OP framework from ROBOTIS and Virginia Tech University, is being actively developed by Trossen Robotics and the Trossen Robotics Community. We will continue to refine and expand this software, providing multiple control interface solutions. This includes a node.js based API so that the robot can be connected to ROS and the Intel XDK for cross-platform application development. Users will also be able to build programs and apps from many different languages to deploy and share on tablets, smartphones and more. The goal of the API is to easily expose higher level functions of the robots so that developers can bring the robots to life without having an in depth knowledge of more advanced lower level functions that make the robot move and walk. The HR-OS1-Framework is being developed and tested on Ubuntu, Raspbian and OpenEmbedded operating systems. Like the HR-OS1 hardware, all of the software will be available completely open-source and available for anyone to download. The AX-12A servo actuator from ROBOTIS is the most advanced actuator on the market in its price range. This servo has become the defacto standard for the next generation of educational robotics. AX-12A robot servos have the ability to track and report their speed, temperature, voltage, load, and shaft position. The control algorithm used to maintain shaft position on the AX-12 actuator can be adjusted individually for each servo, allowing you to control the speed and strength of the motor’s response. All of the sensor management and position control is handled by the servo’s built-in microcontroller – this distributed approach leaves your main controller free to perform other functions. The HR-OS1’s Orion Armor set is in beta, but available for download, printing, and customization at the Interbotix Labs Shapeways Store (free registration is required for file download from shapeways). You can order your own frames directly from shapeways in a variety of materials types and colors, allowing you to customize your HR-OS1. You can further customize your robot by modifying our provided samples or creating your own designs. When your done you can share and mix up design ideas with other users!